Using mosquito coils in home or workplaces generates smoke that can control mosquitoes to a large extent. This is commonly used around the globe. However, the smoke may contain pollutants or toxic elements of health concern. 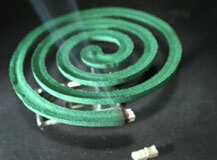 @ Mosquito coils are made of substances like coconut husk, sawdust and dyes to keep them burning for up to eight hours. @ Pollutants released by mosquito coils exceed air safety levels. @ Exposure to the emitted smoke can pose significant acute and chronic health risks. @ Breathing in too much smoke will increase the risk of asthma and cause persistent wheezing in children. @ Harmful chemicals like formaldehyde, octachlorodipropyl ether and bischloromethyl ether which USED IN MANY BUG SPRAYS are released from burning them. @ Pyrethroid insecticides which is used in bug sprays is the active ingredient in mosquito coils. It is basically harmless to humans but can irritate the skin and eyes. Some people are allergic to them. @ Formaldehyde, a by-product of burning Mosquito coils can cause nasal or sinus cancer and even leukaemia. @ The amount of formaldehyde released from burning one mosquito coil can be as high as smoking 51 cigarettes. @ When S-2 (octachlorodipropyl ether) is burned, bischloromethyl ether, a strong and harmful chemical that causes lung cancer, is released. @ A chemical used in these mosquito repellents is a nerve poison. It affects the nervous systems of mosquitoes. Many people are allergic to the vapours coming out of mats and do not use them.